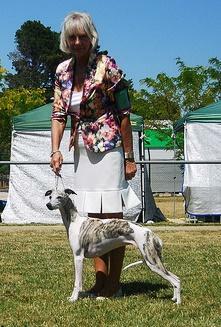 Desty at her first Royal with owner-handler Yvonne Barter. Looking on are co-owner Ray Barter and Pauline Hewitt. 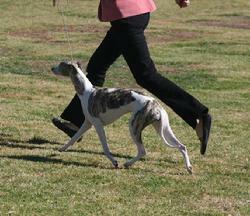 With her trademark floating gait, Desty takes her first Best in Show at only age two, piloted by Yvonne Barter (Satang). 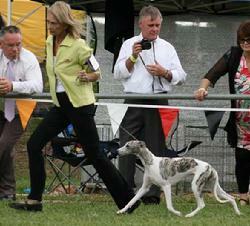 BIS MBIG Ch Nysa Hill Tryst of Destiny at Satang (Imp USA) - "Destiny" - Owned by Ray and Yvonne Barter of Satang. Bred by Angie Diehl (Nysa Hill, USA) and Kathy & Taylor Wilkinson (Destiny/USA). Desty her last night at Nysa Hill before departing for Satang in Australia. 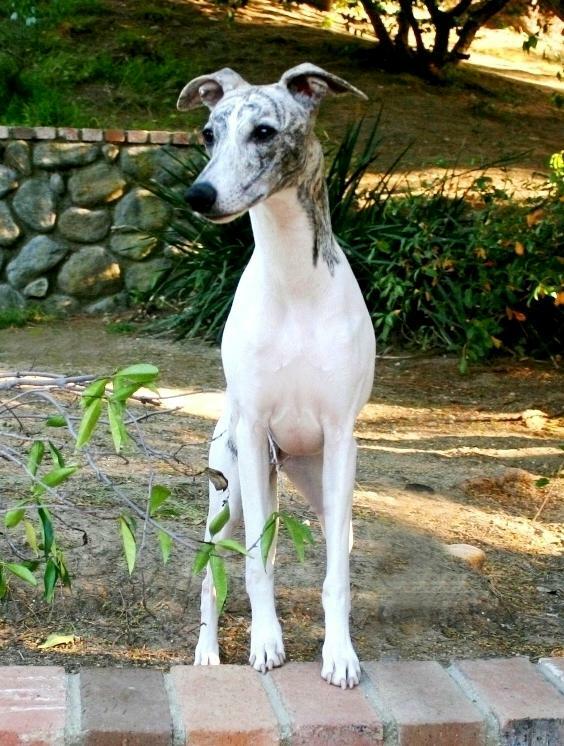 Nov 2009 marked the arrival of striking Reign x Moxi grandpups out of shapely Moxi daughter Spirit, featuring a pedigree rich in Saxon Shore, Chelsea, Endeavor, Starline and Nysa Hill whippets, and additional breed notables such as Dash, Jasper, Davis and more. With her smooth S-curves, lovely neck and head, and her floating gait, Destiny was clearly a show pick from the start, turning heads in the puppy classes Stateside. 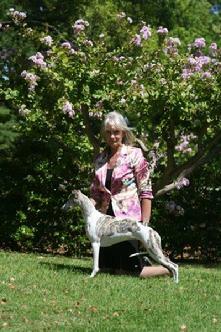 She has been chosen by renowned hound breeder-judges Ray & Yvonne Barter of Satang in Australia, and their keen eyes and sighthound sense have been proven sound indeed, as Desty reaps awards and accolades from judges across the globe.